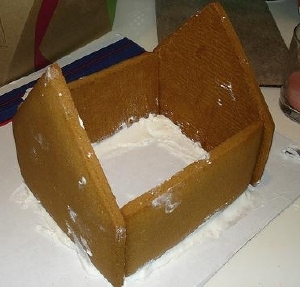 One of the most enjoyable parts of building a gingerbread house is the gingerbread house construction phase. At this point, you should have your gingerbread baked with the house shapes cut out. You can find great gingerbread recipes throughout this website to use to help you with that. For this project, we are performing our gingerbread house construction from these size pieces. You can adjust them as you see fit for your own design. But, remember that the gingerbread house construction is important to the strength of your house so you should first have built a model out of cardboard. Cut out your walls based on those dimensions. Spread or pipe a 9 inch line of icing onto a cake board (or whatever you will build your house on.) Press in one of the side walls so that it sticks firmly and stands upright. If necessary, spread or pipe a little extra icing along either side to help support it. Hold it firmly in place without moving for at least 2 minutes so that it has time to set. Take an end wall and ice both the side edges. Pipe a line of icing on the board at a right angle to the first wall. This corner will be important to get straight so use a ruler to guide you to make a 90 degree angle. Press the end wall into position. Repeat this process with the other two walls until they are all in position. Sidewalls and end walls will form a rectangle box. Rest time. Leave the walls to harden together for at least two hours before putting on the roof and gables. If you want to make it easier, instead of designing your gingerbread house construction with gables, simply cut out gingerbread pieces that are a solid combination of the end walls and gables. Spread or pipe a thick layer of icing on top of all the walls. This will allow you to affix the gables on top. Hold in place for at least 1 hour to allow to harden. Or, if you arent doing separate gables, you can begin the roof phase. Pipe icing along the edges of the gable that you will use to attach to the rough. The rough is the trickiest of pieces to attach. Fix the roof pieces in position; the roof should overlap the walls to make the eaves. Pipe a little icing along the crest of the roof to hold the two pieces firmly together. It must set for at least a full 24 hours before you decorate. To help give the rough some support, you can use cardboard pieces to help hold it up. But, this shouldnt be necessary if youve allowed enough time in between fixing and setting phases. As you know, the icing plays an important role in the assembly of your gingerbread house. Use one of our preferred gingerbread house icing recipes for the best results. 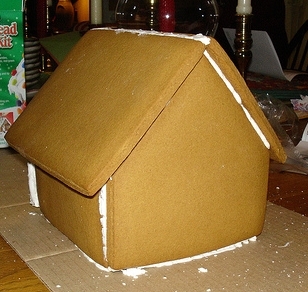 When assembling, use the gingerbread house icing to apply the joints of the house. Apply a generous amount  but not dripping- to glue one side of the joint. Put the icing on only one side and then press the other side to the side with the icing glue to connect them. Hold this in position briefly until the icing has set and the two pieces will hold together. You can also use cans or other sturdy objects to help support the pieces until the "glue" dries. You can also use gingerbread house icing to connect the walls to the floor. Use the same technique explained above. To apply candy decorations, use a small amount of the icing again as the glue to fasten the candy pieces to the gingerbread house. Hold the candy piece in place until it sets. You can also use dough scraps to roll out added decorative cut-outs to be applied with icing glue. You can impress the cutouts with designs before baking for an added touch. If you want to have the walls covered in icing, you will want to thin the icing with a bit of water and spread it gently on the sides before you assemble the house. Allow the icing paint to dry before continuing to assemble the house. You will want to apply the glue icing using a pastry bag so you have more control over where the icing is going. If you allow it about 30 minutes to set before you assemble, it will help the pieces adhere better which makes your completed house stronger. For the icing decoration, use your pastry bag again but with various decorating tips or a knife. You can easily fill in gaps and smooth gingerbread house construction errors with icing and candy decorations. Wipe off smudges or drips with a clean, damp paper towel. Just let your artistic instinct kick in here to help you decorate smoothly and creatively. Now that you've completed your gingerbread house construction, you can move on to the most fun phase... decorating! This is where your edible house turns into a dream gingerbread house! Click here to learns LOTS more about decorating your house. Want to see Video Demonstrations of Gingerbread House building? These videos will teach, entertain, and inspire you. Have a question or an idea about gingerbread house construction?